Play your NES games with just one cart! The NES flash cart is finally here and it couldn't be easier. 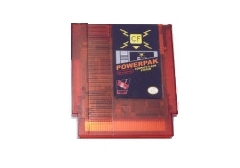 Just copy your games onto one compact flash card, insert into the PowerPak, and play! 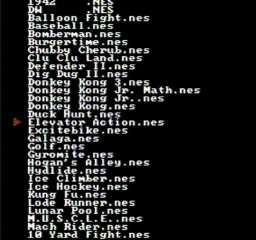 When you start your NES you get a file browser to choose your game. Then you can save and load battery ram so all your saved games stay saved. Save files can also be transferred to and from your computer for use on emulators. 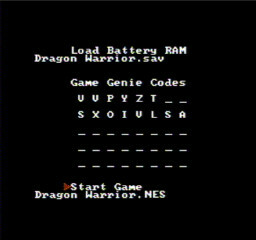 Built in Game Genie code support lets you use cheat codes. 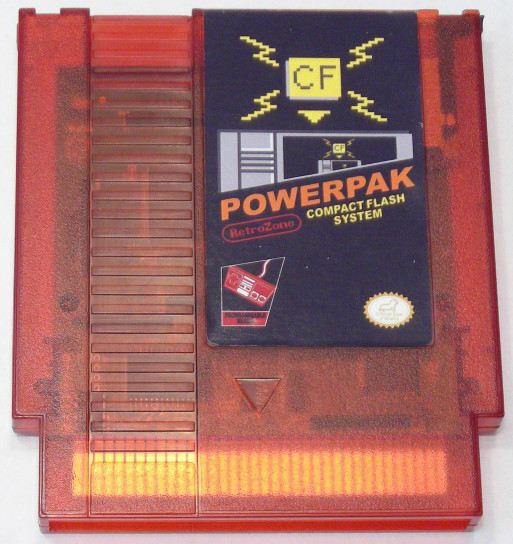 Even better than the original Game Genie, the PowerPak has support for 5 codes at once. Games load very fast, average around 7 seconds. This means a quick cycle for homebrew development on any mapper. Now you can see your game on real hardware instead of relying on emulators. FAT16 or FAT32 format is used so there is no special software to load games onto the card. Organize your games in folders any way you want for faster browsing. Compact Flash is used instead of something else like SD for maximum speed. The NES processor is the bottleneck so the parallel CF card is more than 10 times faster than the serial SD card. The entire PowerPak system is updateable for future additions and bug fixes. All mapper files are stored on the CF card for easy upgrading. Just download the most recent Mappers file below, unzip, then copy the folder to the root of your CF card. Using CopyNES the boot rom can be reflashed but this will hopefully never be needed. If it is needed and you do not have a CopyNES, you just pay the shipping to get your PowerPak here and I will reflash then mail it back free. Browse the card to select your game Choose battery RAM and Game Genie options Play! PowerPak requires a CF Card to store files and your games . A CF Card Reader is needed to load files from your computer on to the CF card. CF card and reader are not included!. What type of CF card do you need? 1,000 NES games takes up approximately 200MB, so any size between 256MB and 32GB will work and be enough space. Larger sized cards may have issues. CF card transfer speed should be 133x (20MB/s), faster cards may have issues. 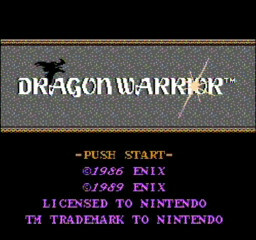 Works on authentic Nintendo Systems including NTSC, PAL A, PAL B, and Asian top loader and toaster systems. Does NOT work on clone systems like the NEX, Yobo, or FC Twin. PAL compatibility has not been fully tested, only that it will run games. MMC5 support not implemented yet. The PowerPak DOES have enough hardware to do it. There may still be some sprite related graphics glitches on some NES systems. File display does NOT sort alphabetically. Sorting would just be too slow for the NES processor. Some emulators (Nestopia) use .sav files that are actually .zip files. These will need to be expanded before transferring. DIP switches in arcade games will not work. They are not physically possible from the cart side. Any game with PRG or CHR larger than 512KB will not work. Most are listed as Bad Mappers above. Only the first logical partition on the CF card is used. Inside the PowerPak is a Xilinx FPGA, 512KB prg space, 32KB battery ram space, 512KB chr space, boot rom, and glue logic. The FPGA has extra graphics ram for four screen games and MMC5 exram. No processors are used; the NES 6502 controls everything.